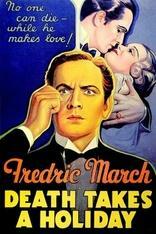 Death (Fredric March) is unable to relate to humans, so he takes the form of Prince Sirki, and tries life as a person. Many women are instantly attracted to Prince Sirki, but once they really get to know him, they become frightened. It isn't until he meets the beautiful Grazia (Evelyn Venable) that Death finally learns what it is to love. But when Grazia's father (Guy Standing) learns of Prince Sirki's real identity, he tries to break up the relationship.